Robin Carol is a new author for me and I plan on reading more of her books. I loved this story. There was great suspense and a bit of romance. I did not want to put this book down. Landry and Nikolai were wonderful together. I would love to read more books starring these two characters. I received a copy of this book from Barbour for a fair and honest opinion that I gave of my own free will. A hunt for the Dutchman’s Lost Gold Mine becomes a race of survival. Former Army MP Landry Parker fell into the recovery specialist role quite by accident—to help her ailing father. Now that she’s on her own, she is determined to prove herself and honor her family legacy. After being shot in the line of duty, former police officer Nickolai Baptiste became a recovery specialist, and he’s good at his job—maybe even the best. A potential client pits Landry and Nickolai against one another to find the Dutchman’s Lost Gold Mine map that was stolen from her murdered husband, and the potential payday is too enticing to pass up. The trail takes them from New Orleans to Weaver’s Needle in Arizona where legend claims the mine is hidden. Landry and Nickolai are no strangers to adventure, but the unlikely partners quickly discover there’s someone after the treasure and there are those who want to ensure the lost mine in Arizona’s Superstition Mountain stays lost forever. Can Landry and Nickolai work together despite their distrust of each other to save the legend before more innocent lives are lost? Will they find the real treasure isn’t the gold, but something more valuable. . .true love and understanding? This was fantastic. I love the continuing characters. This is book seven of The Matchmakers of Huckleberry Hill and I love Anna and Felty. They are great matchmakers. Reuben comes to stay with Anna and Felty when he believes that everyone in his hometown is laughing at him. Fern comes to Huckleberry Hill to try to cheer Reuben up and get him to come home. While at Huckleberry Hill Fern and Reuben learn many lessons. I did not want to put this book down. I received an ebook copy of this book from Celebratelit for a fair and honest opinion that I gave of my own free will. jennifer Beckstrand 1Jennifer Beckstrand is the award winning Amish romance author of The Matchmakers of Huckleberry Hillseries and The Honeybee Sisters series for Kensington Books. Jennifer has always been drawn to the strong faith and the enduring family ties of the Plain people and loves writing about the antics of Anna and Felty Helmuth and the Honeybee sisters’ aendi Bitsy. Jennifer has a degree in mathematics and a passion for Jane Austen and Shakespeare. She and her husband have been married for thirty-two years, and she has four daughters, two sons, and soon-to-be six adorable grandchildren, whom she spoils rotten. Anna Helmuth is starting a knitting club, but that’s not all she’s got up her sleeve. My family. I have five sisters and no brothers. I think my mom made every dress in this photo, including her own. In Return to Huckleberry Hill, Anna Helmuth and Fern King decide to start a knitting club in order to introduce Anna’s grandson Reuben to some girls from Bonduel, Wisconsin. Anna is a very good knitter, with years of practice making baby blankets, scarves, mittens, and potholders. One of Anna’s scarves actually saved someone’s life, and her potholders have helped her make many a match. I have a friend who is a wonderful cook. Making a delicious, beautiful meal is how she tells her family she loves them. I don’t consider myself a great cook, but I still take pride in putting something nutritious and satisfying on the table for my family. It seems to me that some of the “home arts” that our mothers and grandmothers practiced are dying out. Who knows how to tat anymore? Or embroider? Some of these arts have died because of expediency. Who doesn’t think today’s stocking choices are more comfortable and practical than knitted wool ones? Others have died out because so few people want to learn. What about you? Do you still practice any of the home arts that your grandmother did? What do you want to pass on to the next generation? June 5: A Simple Life, really?! I loved this story. I had never heard of a chapel car before. It is a wonderful idea to take a chapel to the small towns through the use of a train. It is fascinating. I love all the characters in this book. They are great together. Every character needs to learn some very interesting lessons throughout this story. Can Hope and Luke get together? I received this book from Bethany House for a fair and honest opinion that I gave of my own free will. This was my favorite if this series for a few books. I love when all the characters are used. I do like to see Sarah’s mother used a bit more though. I did not want to put this book down. This had a wonderful story and a great use of characters. The ending was a surprise for me and I love when I am surprised. I look forward to many more books in this series. It always seems to be fresh. The latest Gaslight Mystery from the bestselling author of Murder in Morningside Heights finds Sarah Brandt and Frank Malloy searching for a connection between a murdered newsie and a high society woman with dangerous habits. Frank Malloy’s latest client is the well-dressed Will Bert. He’s searching for his brother, a newsboy named Freddie, so he can share his new financial good fortune. Frank makes quick work of the case and locates Freddie, but a happy reunion between brothers is not in the cards. When Will’s name is mentioned, Freddie runs off—only to be found dead a short time later. Suspicious, Frank tracks down Will who spins a tale of lust and deceit involving a young society woman, Estelle Longacre, also recently deceased. Frank can’t be sure if Estelle’s risky behavior and the company she kept was to blame, or if her own ruthless family had a hand in her death. Frank will need Sarah’s help to unearth the dark secrets of the wealthy Longacres and to discover if there is a connection between Estelle and Freddie’s death. Together they must navigate a perilous underground web of treachery to find the truth. I enjoyed this story. This is book 15 of a series based in Cutter’s Creek but you don’t have to have read any of the previous books to enjoy this one. This was the first book that I have read by this author and I hope to read more of this series. I really liked Ruby and Beau. They had many of the same qualities. I received an ebook copy of this from Celebratelit for a fair and honest opinion that I gave of my own free will. Ruby’s heart froze as she threw her dead husband over the cliff.When Beau walks into her life, one glance has her running from her past. He couldn’t want someone like her. It should be easy to avoid his quiet charm.If he can convince her she’s a prize, not prey, he might have a chance. Beau’s captivated when Ruby scrambles from him whenever he gets too close. Her sweetness is an allure he can’t fight. Can Beau convince Ruby she is beloved? Medium res.Kari Trumbo is an inspirational romance author, blogger and proud home schooling mother to four great kids. She interacts often on reader groups on Facebook and volunteers at the local library when needed. When she isn’t writing, she is obsessively reading and expanding her skills as a wordsmith. Kari lives in her great-grandfather’s remodeled 1890-built home in central Minnesota with her husband, children, cats, and one hungry wood stove. Greetings! I hope this isn’t your first introduction to Cutter’s Creek, but if it is, let me explain a bit about it. Cutter’s Creek is a series written by myself and three other Christian authors. Though there are numbers on each book, you don’t have to read them in order to get into the series, in fact, since each author writes in their own time period it might be somewhat confusing. Especially if you like a consecutive story. However, they are all stand-alone books and can be read in any order. If you like to read them in date order, you’ll want to read Kit Morgan’s books first, then Vivi Holt, Annie Boone, and finally mine, that will put them roughly in time order. The Cutter’s Creek series has been a huge blessing to me. I’ve gotten to write with some wonderful authors and learned so much about writing a series together. So, out of my Cutter’s Creek books, why did I choose Ruby over Lily, Ivy, or Carol…well, I hate to play favorites, but Ruby is my favorite. She’s quiet, and her strength is surprising. She has a big trial, and some hurt to work through, but when you find the right person to help you through it, that’s a gift more precious than anything. I loved this book. I did not want to put it down. I really liked Alice, Great and Rick. This takes place right at the end of WWll. This is taking place in a small town in West Virginia. One wouldn’t think their could be this much intrigue in a small town. Are there spies or is Alice just not thinking correctly. I hope to read many more books by Tamera Lynn Kraft. I received an ebook copy of this book from Celebratelit for a fair and honest opinion that I gave of my own free will. IMG_9978-8Tamera Lynn Kraft has always loved adventures. She loves to write historical fiction set in the United States because there are so many stories in American history. There are strong elements of faith, romance, suspense and adventure in her stories. She has received 2nd place in the NOCW contest, 3rd place TARA writer’s contest, and is a finalist in the Frasier Writing Contest and has other novellas in print. She’s been married for 38 years to the love of her life, Rick, and has two married adult children and two grandchildren. Tamera has two novellas in print: A Christmas Promise and Resurrection of Hope. 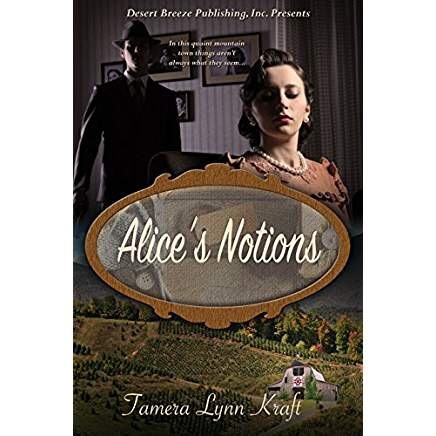 Her first full length novel, Alice’s Notions released in April through Desert Breeze. One thing I loved about writing my post World War Two novel was my main character’s passion for movies. Alice Brighton and her late husband loved to go to movies on Friday nights. Now, even after the war made her a widow, Alice still loves movies and compares everyone she meets to a movie character. Of course for Alice, all these wonderful classic movies and movie stars and a part of her culture, but for me, it was so much fun because I love classic movies. In the novel, Alice compares her landlord to Cary Grant. Cary Grant is one of my favorites. After starring in movies like Suspision, Arsenic and Old Lace, and Notorious, Grant was one of the biggest stars around in 1946 when Alice’s Notions takes place. My favorite Cary Grant movie wouldn’t be made until a few years later. An Affair to Remember, released 1957, with Cary Grant and Deborah Kerr is one of my all-time favorites. At one point in the novel, Alice thinks back to when her late husband always said she reminded him of Judy Garland. Garland would have been twenty-four at the time, just a bit younger than Alice, but she became a big star in her teens. She began acting at two years old when she debuted as Baby Francis and sang Jingle Bells. After playing in various roles including a few movies with Mickey Rooney, Garland had her big break in The Wizard of Oz. She went on to star in a ton of movies and had a thriving singing career until she committed suicide in the 1960s. One of my favorite Judy Garland movies released in 1945 during the war was The Clock. The Clock was about a woman who met and fell in love with a GI on leave. Their romance was intensified because they only had the weekend before he was shipped out again for the remainder of the war. This movie must have been in Alice’s mind since she had lost her husband shortly after the movie came out. During Alice’s Notions, Alice goes on a date to see the movie, The Postman Always Rings Twice, starring Lana Turner and John Garfield. It was released in 1946 and was considered scandalous at the time because the two main characters have an affair and murder her husband. The main theme of the movie is you can’t get away with your sin. The truth will be revealed. In Alice’s Notions, the truth being revealed is also a main theme. So you may be wondering what classic movie Alice’s Notions reminds me of. Charade with Cary Grant and Audrey Hepburn was released in 1963. In that movie, Hepburn is being pursued and doesn’t know who she can trust. The movie has light hearted intrigue, suspense, and romance just like Alice’s Notions. Alice, also, doesn’t know who she can trust. To celebrate her tour, Tamera is giving away a $25 Amazon Gift Card! This had a great story line to it. My only problem I had was in the first three or four chapters I was confused sometimes what story I was starting to read. This book has three stories interwoven together. The main story is about Evelyn and Nathaniel and their son Buddy. The other two stories are books that Evelyn is writing. I really enjoyed each story and all the characters. They each learn to trust in God and themselves. I received an ebook copy of this from Celebratelit for a fair and honest opinion that I gave of my own free will. Contrary to her parents’ wishes, Evelyn married a nonbeliever, but it all works out . . . or does it? Not only did the love of her life accept Christ, Nathaniel got baptized by fire and became a minister of the gospel. Woven into the breathtaking tale of love and redemption are two additional stories, Evelyn’s novels of faith, family, and forgiveness. FireplaceBkgrndCaryl McAdoo loves writing stories for all ages that glorify God and is thrilled Christian fiction fits her life purpose so well. Bold not bashful, she’s quick to share the Bible principles she lives by through her characters and hopes each title ministers His love, mercy, and grace. Known as the “Singing Pray-er”—with a YouTube channel to prove it—the prolific hybrid author also loves praising Him with new songs He gives her. Her high-school-sweetheart-husband moved the family from the DFW area—home for fifty-plus years—to the woods and seat of Red River County. After Ron, Caryl counts four children and sixteen grandsugars life’s biggest blessings. The McAdoos live a few miles south of Clarksville in the far northeast corner of the Lone Star State with two grandsons. Mighty to Save, book nine, is unlike all the other stories in the Texas Romance family saga as the heroine, Evelyn Eversole—you’ll remember her as little Evie in book eight, Covering Love—and hero, Nathaniel Nightingale, are already married in Chapter One. Where’s the romance, Caryl? You may ask. But I think you’ll see that Mighty to Save is brimming with all the stuff love is made of! The depth of the Nightingales’ love is revealed and tested, and because Evelyn is a novelist like her MayMee (May Meriwether), we are privileged to experience the love of another couple whose progeny is intertwined with the Nightingales’ lineage. (knowing the characters of the next novel Chief of Sinners that was written over twenty years ago and served as the foundation of the Texas Romance series, it’s been a labor of love, tying all these characters together. And while a very few have remarked that it’s a little hard jumping back and forth in time, the majority of readers have expressed their satisfaction and appreciation for getting to know the backstories in such a fun way. This tale deals with imperfect people—as we all are. I hope my characters come across as real, someone in your family or who might live next door. In this world, we will have tribulation . . . but being of good cheer isn’t always so easy. Sometime those trials knock us off our foundation, and we find ourselves in an ocean of mire, like trying to swim through jello . . . weary of it to the point where only God can save us. And so we cry out to Him. And He does. Should that mean what waylaid us no longer has any effect on our lives? Not every time. I pray that you will enjoy Mighty to Save. This story is another reason why I’m so blessed that God led me to publish independently of the traditional houses, as I’m most certain it would definitely not fit their pigeon hole titled Christian Romance. Life offers hills and valleys. Could we truly appreciate one without the other? Fair warning, don’t be expecting same-O same-O! Thank you so much for being a part of my Celebrate Lit Blog Tour Launch! Bloggers, readers, reviewers, and visitors all—everyone at the awesome Celebrate Lit Tour Company, too—y’all are such blessings to me! So much so, I could never repay your kindnesses, encouragement, and support. But my Father can, And I pray He will send every blessing back to you a hundred fold! Grand Prize: ALL NINE books in the Texas Romance series!